Alvaro Noboa, leader of the National Party Adelante Ecuatoriano Adelante, revealed that his quest to reach a consensus has started to bear fruit. He advanced that the CFP and Patriotic Society are some of the parties with which he is about to closing the agreement. “I have good news I cannot give yet, we have advanced enough, and big parties such as Patriotic Society, which came in second place in 2009 and third in 2006 look with good eyes this alliance, therefore, these would be two tremendous battalions: the Patriotic Society battalion and the popular battalion of Adelante Ecuatoriano Adelante, which will participate in these elections hand in hand, together and allied, in benefit of the people and for the sake of the renovation,” he said without elaborating. Meanwhile, his wife, Dr. Annabella Azin, who was also present, reiterated iher support to the bases and reaffirmed her willingness to serve the party. “I reiterate my support as I have always reiterated it to my husband, Alvaro Noboa, leader of the Adelante Ecuatoriano Adelante party … I am convinced of his proper political management and all conversations that are taking place and will take place, will be very convenient for Ecuador in this struggle to reach a unity and to launch one single nomination. I repeat again and again, I am at the disposal of what our leader Alvaro Noboa decides and what the Adelante Ecuatoriano Adelante decides,” Azin stressed. Finally, the Ecuadorian businessman reiterated that his party is still seeking the unity, they are talking with other leaders of national parties to reach a consensus to launch a single candidate ‘the renovation, and change candidate’ versus the candidate of Alianza PAIS, who would be the candidate of ‘continuism.’ If failing to achieve a renovation candidate, his party will always have Alvaro Noboa as as a wildcard. “Adelante Ecuatoriano Adelante will have a presidential hopeful, there is no doubt about it, it will also have candidates for the Assembly representing all the provinces of Ecuador, there is no doubt about that neither; that candidate will be the result of the union of the parties led by Mr. Guillermo Lasso, Mr. Lucio Gutierrez, Ms. Cynthia Viteri, Mr. Walter Freire, and the Adelante Ecuatoriano Adelante party, hopefully one single candidate is chosen, but if none of the parties agree on this, and only three of four parties reach and agreement, our arms are open to everyone. Left-wing parties, the party of Lenin Hurtado, the Pachakutik party led by Lourdes Tiban and other leftist movements are welcomed. In this election we will not see if they are from left, center or right, we will see if they want a change or they want that the current president or his party continue, that’s what we will see. 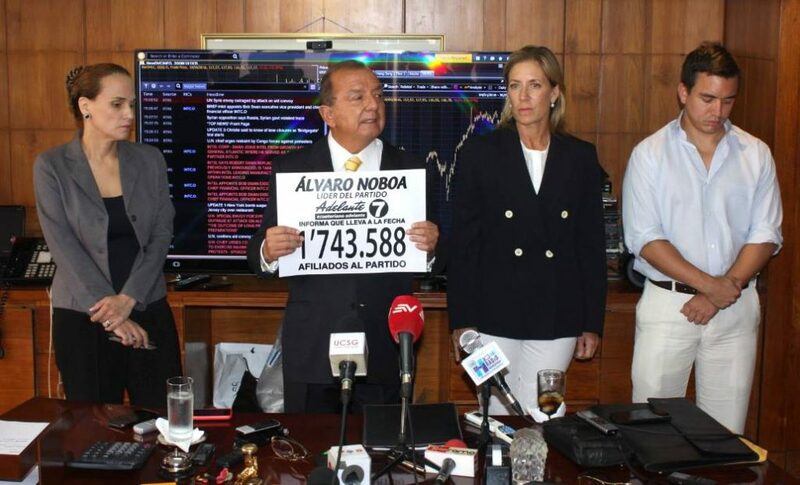 Alvaro Noboa has announced that so far the party has raised nearly two million signatures, and added that if this continues this way, they would become the party with more affiliates nationwide, because their goal is to achieve the renovation and the change in Ecuador.